You'll be £19.99 closer to your next £10.00 credit when you purchase The Decisive Campaigns of the Desert Air Force 1942-1945. What's this? Compared to the RAF's Fighter and Bomber Commands, the Desert Air Force (DAF) is far less well known, yet its achievements were spectacular. DAF led the way in North Africa and Italy in pioneering new tactics in close Army-Air Force co-operation on the battlefield, DAF and Allied air forces gave Allied armies in North Africa and Italy a decisive cutting edge. While the Axis forces used the many rivers and mountains of Tunisia and Italy to slow the Allies' advance, DAF was there to provide that extra mobile firepower – the artillery from the sky. They were the first multi-national air force, and the first to introduce air controllers in the front lines of the battlefield. With first-hand accounts by veteran airmen from Britain, Australia, Canada, New Zealand, South Africa and the USA, this book reveals the decisive victories with which DAF won the war over North Africa, the Mediterranean and Italy in 1942-45. Evans does a good job of tying the aerial fighting to the on-going ground battles, not something every aviation author achieves... There is a good mix of individual accounts of the fighting and overviews of the action... Evans is also very good on the human cost, showing how success on one day could be followed by death or injury on the next. A concise account of the operations of a unique command. Tells the previously untold story of how the DAF was the most decisive single factor in winning the three battles of El Alamein, and victory in the North Africa and Italy campaigns. This work on the Desert Air Force is a most welcome addition to the historiography of the air aspects of the war in North Africa and the wider Mediterranean. This book makes excellent use of the Operational Record Books of the various squadrons involved and uses a number of veterans' accounts...[it]will have considerable appeal to a wide ranging readership, but especially those interested in the tactical detail and personal experiences of the airmen involved in the various campaigns. The Desert Air Force wrote the book on ground/air cooperation and the story of how it did so is told well in Bryn Evans' new book, a fine tribute to the Force and to the men who served in it. As seen in the Telegraph & Argus. I have just finished reading The Decisive Campaigns of the Desert Air Force. It was a wonderful read. As a former Commanding Officer of No 3 Squadron I was well acquainted with its long and distinguished history, particularly in WW II, and the book gave context to that history for me. I was well aware of much of the North African campaign from talking to veterans of the campaign and former members of 3SQN; however, the detail of the Italian campaign was less well articulated. The book was extremely informative regarding the intensity, trials, losses and hardships of what must have seemed a never-ending series of battles. I was not aware of the Luftwaffe attack on Bari. While the new book comprehensively covers the breadth of the desert campaign, it is the story of two modest Australian flyers that jumps off the pages. Remarkable story. 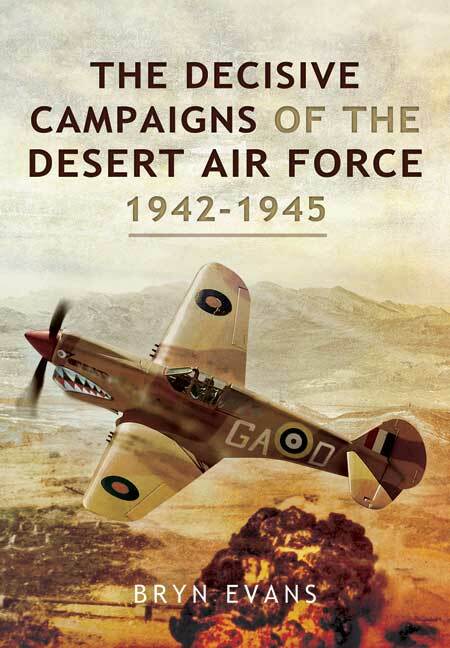 The author has carried out detailed research to tell the largely unknown story of the Desert Air Force, DAF. There is a well-selected photo plate section and maps in the text body, to reinforce and support an absorbing text. This is an excellent account of air operations and tactics of the air battles in North Africa, the Mediterranean, and Italy. As seen in 'National Wings'. An engaging and very full account of the DFA's exploits through North Africa, Sicily and into Italy. This is an excellent account of a lesser-known period in military aircraft history. On the day that Montgomery took command of Eighth Army in Egypt in August 1942, he addressed his staff at their HQ. One of the most welcome announcements was that they would be moving to a new site alongside the RAF on the coast. It was welcome not only because it was a more salubrious location, but also because it spelt the beginning of a new way of waging war. As Monty would say at every opportunity, the air battle had to be won first and he was to ensure that co-operation between ground and air was entrenched in all his future operations. Although a Prologue tells of how the Western Desert Air Force, as it was originally called, was created out of 202 Group RAF in the autumn of the previous year, Bryn Evans’s book really opens about a month before Monty arrived, following Eighth Army’s precipitate retreat from Gazala,. It was conceived from the beginning as a tactical air force, whose single purpose was to support the ground forces. It would accomplish this through reconnaissance, through the achievement of air superiority, through the interdiction of the enemy supply route – and attention is devoted to the sinking of ships bringing fuel to Rommel, a vital factor in his decision to retreat from El Alamein – and through ground attack in support of the troops. It was perhaps the last of these for which it was best known, but it was only in the spring of 1943, just before the Battle of Mareth, that the techniques were developed which were to give the army enormous fire power on demand through the ‘cab rank’ system of forward air controllers in armoured cars on the front line. What Evans does well is to focus on the individual actions which took place, using both squadron records and the personal accounts of some of the participants. He includes in the book a separate index by nationality, which immediately draws attention to one key feature of the Desert Air Force, the extraordinary diversity of the nationalities represented. In addition to British, Australian and New Zealand squadrons, there was a very considerable contribution by the South African Air Force, whilst Poles and Free French were also represented amongst the pilots. Most surprising to me was the important role of American fighter and bomber groups, one of which was in the Desert Air Force from El Alamien to the River Po. This was a truly Allied undertaking. The Desert Air Force’s commanders are well covered, from ‘Mary’ Coningham in the early days to Harry Broadhurst, probably the most influential of them all in terms of its development, William Dickson, who would in due course become Chief of the Air Staff and the first Chief of the Defence Staff, and Robert Foster. It was the Allies’ very good fortune to have men such as these at the helm of one of their key formations. Evans, however, focuses much more on the pilots, many of whose exploits are graphically recorded. Some, such as Neville Duke, who achieved post-war celebrity as a test pilot, and Hugh ‘Cocky’ Dundas, the youngest ever group captain in the RAF at the age of 24, became well known, but most were unsung heroes. Their contribution to the war in North Africa and later to the campaigns in Sicily and Italy, in which the Desert Air Force retained its name with pride, was out of proportion to their numbers. It is difficult to imagine how Eighth Army would have waged war so successfully without it. This is by no means the first book on the subject, but it is a worthy addition to the bibliography and I strongly recommend it. This is an ideal book for those researching their family history or wanting to understand the service life of a member of the Desert Air Force. The combination of "big picture" strategy and gripping personal experiences in this well-balanced book will deliver an excellent understanding of both the era and the momentous achhievements of the DAF. The North African and Italian campaigns are shown from the perspective of Allied air power, particularly the Desert Air Force. The winning of air superiority and the ensuing air - ground support for Allied armies, made the crucial difference to bring the Allies victory, acknowledged by commanders of both sides. Bryn Evans is a management consultant with many years’ experience of finance and IT at boardroom level. As well as military history Bryn writes extensively across a wide range of categories, be it business management, sport, travel, or fiction, and his work has been widely published. His fiction work has earned a Second Prize in the Catherine Cookson Short Story Competition and other awards. Bryn is the author of With the East Surreys in Tunisia, Sicily and Italy 1942 – 1945 (2012), and The Decisive Campaigns of the Desert Air Force 1942 – 1945 (2014), both published by Pen and Sword Books Ltd, UK. In his research he has interviewed veterans and their families world-wide, and visited battlefields and campaign locales in Egypt, Tunisia, Sicily and Italy. After periods residing in UK, Zambia, and Germany, Bryn his wife Dr Jean Evans have lived for many years in Sydney, Australia.